Know what you want the custom dunnage to do. You may need to keep parts separated so that they do not touch each other, or you may need to support quite a bit of weight. You may even need multiple layers of dunnage in one container. Knowing this information will help determine what styles are best for your needs. Evaluate the different types of custom dunnage, and interview your operators to see which options they prefer. Plastic corrugated partitions may be cumbersome to handle. Fabricated or molded foam may take up too much space. Stackable, returnable plastic trays may take more time than your operators have. By asking them first, you will be able to obtain first-hand information on how these solutions can help your business. Consider custom dunnage that can be cleaned, modified, or repaired. Certain types of dunnage can withstand cleaning, whereas other types can be modified easier. Determining your needs and where you project your needs to be in the future can help you determine what is best for your business. If you purchase dunnage that can be easily modified, this will save you from having to place another order for a different application in the future. Plan ahead. Because it is custom-made, custom dunnage requires a longer lead time. By forecasting your needs and planning ahead, you can avoid the unnecessary expense of having to place a rush order. Keep a safety stock of custom dunnage for emergencies. Because of its longer lead time, it sometimes helps to have extra in stock in case you should need it. By ordering a little extra, not only will you have it on-hand when you need it, but you may also be able to negotiate a lower rate by placing a larger order. In closing, custom dunnage is a critical component of returnable packaging. These 5 tips can help you communicate effectively with your packaging producer and most importantly keep your costs to a minimum. As always, rely on your packaging producer for guidance and direction. This entry was posted in Bulk Containers on November 24, 2011 by madden_david. Container Exchanger specializes in used metal and plastic bulk storage bins. We are experienced in selling and distributing bulk storage bins throughout the nation. We are a container supplier selling these collapsible bulk containers or rigid bulk containers to large and small companies throughout North America. Our bulk containers can take many different forms. We generally handle three types of bulk storage bins. Each type is made of a different material. We have inventories on Plastic bulk storage bins, Metal bulk storage bins, and Cardboard bulk storage bins. The metal version of the bulk container can be collapsible, but most often, they are rigid. We have a very nice inventory of the metal bulk containers throughout the nation, but most of the containers tend to be located in Ohio, Indiana, Michigan, Pennsylvania, Missouri, and Ontario. Metal bins are a nice and heavy duty way to handle parts within a manufacturing environment. Rigid metal bulk bins are especially suited to any kind of metal working plant, such as metal stamping, forging, casting, etc. The rigid metal bulk containers are often suited to handle 4,000 lbs or more and can be stacked several bins high. When purcasing rigid metal containers, you may want to pay attention to the thickness of the wire mesh sides as a good indication to the capabilities of the container. We can help you find any metal bins for your manufacturing or distribution system. If you are trying to purchase additional metal containers to complement your current inventory of containers, you will need to provide us with a precise size of the container (length, width, and height). You will also need to note the mating mechanism for the metal storage bin. Pictures are most helpful in this situation, so that we can ensure that the new metal bins will be stack compatible with you existing bins. Collapsible metal storage bins by comparison tend to be lighter duty than the rigid metal storage bins. Collapsible bins tend to be weight rated between 1,500 and 4,000 lbs. The collapsible metal bins are a nice option for a small metal shipping bin. They work well in this situation, because the sides of the container can be collapsed, thereby reducing the size of an empty container. The collapsed storage bin can be stacked in a corner of the warehouse, or they can loaded onto a trailer for return shipment to your plant. We can find just about any bin. Follow this link to see a nice representation of our metal storage bins. The plastic version of bulk containers are almost always collapsible. Here at Container Exchanger, we call these items “Pallet Containers”. These collapsible plastic bulk containers are made from a rigid structrual foam material that is extermely strong and durable. These collapsible containers are suitable for many manufacturing applications, such as part storage a part transport. The weight capacity on collapsible plastic storage bins varies, but generally, the capacity ranges from 1,500 lbs to 2,500 lbs. The other primary options with plastic bulk storage bins is the color and the number of drop doors, or access panels. The access panels provide a way to access product that may be in the bottom of the bin without an operator leaning over the sidewall of the container. Some bins are more common than other bins. Follow this link to see a nice representation of our plastic bulk storage bins. 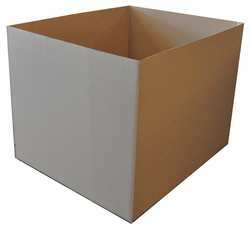 Cardboard bulk storage bins are generally referred to as Gaylord Boxes or Cratons. Most bulk cardboard boxes come from plastic injection molders, where the boxes once held raw plastic resins. Other boxes can come from storing food products, such as watermelons or lettuce. Clearly, due to the different uses for large cardboard boxes, there are many different styles, thicknesses, and weight capacities. No matter what your requirements are, purchasing used gaylord boxes can be challening. There is often more demand than supply, and significant quantities are going to be the minimum purchase amounts. Sizes of bulk carboard boxes can vary significantly, but many boxes are sized for either 40″x48″ pallets or 45″x45″ pallets. Thickness of the boxes can range from 2 layers of cardboard all the way up to 5 layers of cardboard. The number of wall layers is a pretty good indication of the overall strength of the box, where the more layers of cardboard indicate a stronger box. However, this is not always the case, as some bulk cardboard boxes have thicker individual layers than other boxes. Some boxes are rated for a particular capacity, so it is often recommended that you inquire about this feature before purchasing a box. How much will the product within the gaylord weigh when it is fully loaded? What size of pallets do you use primarily? Are you planning on stacking the gaylords? Is the product in the gaylord static or dynamic (dynamic loads require stronger sidewalls)? Do you need full bottoms for the boxes? Do you need top flaps for the boxes? Do you need lids for the boxes? Follow this link to see a representation of our used gaylord bins. This entry was posted in Bulk Containers, Gaylord Boxes, Metal Bins, Pallet Containers, Wire Baskets on November 24, 2011 by madden_david. Container Exchanger specializes in used metal and plastic collapsible containers. We are experienced in selling and distributing bulk collapsible bins throughout the nation. We are a container supplier selling these collapsible bulk containers or rigid bulk containers to large and small companies throughout North America. Our collapsible containers can take many different forms. We generally handle three types of bulk storage bins. Each type is made of a different material. We have inventories on Plastic bulk containers, Metal bulk containers, and Cardboard bulk containers. The plastic version of bulk containers are usually collapsible. Here at Container Exchanger, we call these items “Pallet Containers”. These collapsible plastic bulk containers are made from a rigid structural foam material that is extremely strong and durable. 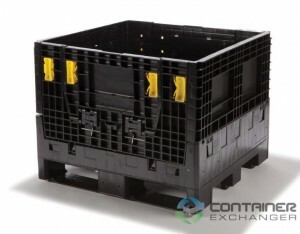 These collapsible containers are suitable for many manufacturing applications, such as part storage or part transport. The weight capacity on collapsible plastic storage bins varies, but generally, the capacity ranges from 1,500 lbs to 2,500 lbs. Some bins are more common than other bins. Follow this link to see a nice representation of our plastic collapsible containers. From a compatibility standpoint, many of these containers from different manufacturers are actually stack compatible with each other. That is, Ropak, Xytec, and Buckhorns usually stack together, assuming that they are of the same footprint size. Collapsible metal containers tend to be lighter duty than the rigid metal storage bins. Collapsible bins tend to be weight rated between 1,500 and 4,000 lbs. The collapsible metal bins are a nice option for a small metal shipping bin. They work well in this situation, because the sides of the container can be collapsed, thereby reducing the size of an empty container. The collapsed storage bin can be stacked in a corner of the warehouse, or they can loaded onto a trailer for return shipment to your plant. We can find just about any bin. Follow this link to see a nice representation of our metal collapsible containers. Cardboard bulk containers are generally referred to as Gaylord Boxes or Cratons. Most bulk cardboard boxes come from plastic injection molders, where the boxes once held raw plastic resins. Other boxes can come from storing food products, such as watermelons or lettuce. Clearly, due to the different uses for large cardboard boxes, there are many different styles, thicknesses, and weight capacities. No matter what your requirements are, purchasing used gaylord boxes can be challenging. There is often more demand than supply, and significant quantities are going to be the minimum purchase amounts. These bulk containers are not necessarily collapsible in a traditional sense, especially when they are compared to the metal and plastic collapsibles. However, they could be considered collapsible in that they are folded down flat for transport. Some businesses use these boxes over and over again, but the useful life of a cardboard collapsible container if probably about 5 uses. Sizes of bulk cardboard boxes can vary significantly, but many boxes are sized for either 40″x48″ pallets or 45″x45″ pallets. Thickness of the boxes can range from 2 layers of cardboard all the way up to 5 layers of cardboard. The number of wall layers is a pretty good indication of the overall strength of the box, where the more layers of cardboard indicate a stronger box. However, this is not always the case, as some bulk cardboard boxes have thicker individual layers than other boxes. Some boxes are rated for a particular capacity, so it is often recommended that you inquire about this feature before purchasing a box. Follow this link to see a representation of our used gaylord containers. 1. Combine different materials such as steel and plastic to reduce overall weight. Steel is traditionally one of the main components in material handling carts and racks, but by substituting a little plastic where you can, you can lighten them quite a bit. 2. Check the market to see if someone is selling used material handling carts or racks. Most can be easily modified to meet different needs. You may be able to save quite a bit by purchasing used. Your packaging producer should be able to locate used racks for you as well. 3. Before placing a large material handling cart or rack order, have a prototype made. This way, your operators will be able to experiment with them, and make any necessary changes, before you commit to a final order. 4. Plan ahead. If your product needs to be handled in a special or unique way, you will want to inform your supplier. Although orders for carts and racks typically have a quick turnaround time, a sure-fire way to waste time is by rushing an order, ordering the wrong thing, and having to wait longer for the right product. 5. Identify everything you need your material handling cart or rack to do before placing an order. If they need to stack, collapse, roll, disassemble, or perform some other function, you will need to inform your supplier in advance. 6. Consider everything you may need to put into a material handling cart or rack. You may find that you want to use them to store supplies and materials as well as finished products. If so, the design of the carts or racks might have to incorporate dividers to accommodate different pieces and parts. You will want your supplier to know this before producing your order. 7. Make a “wants” versus “needs” checklist. Constantly adding new features will add up quickly. Do not eliminate “needs” features in an effort to save money. Rather, if you really want to decrease your costs, cross out only those features in your “wants” column. 8. Inspect and clean material handling carts and racks on a regular basis. Cleaning with mild soap and water will help extend the useful life of your carts and racks. And a little preventive maintenance every now and again will help prevent them from breaking completely. 9. Compare the cost of repairing and modifying carts and racks at your location versus sending them to an outside supplier. Sometimes, your carts can be modified to fit your needs by adding or removing something simple. Save costs by doing this yourself, if you can. 10. When you are done using your material handling carts and racks, consider selling them. Chances are, if they have been maintained and kept clean, there will be another company who can use your used items. Place and advertisement or have your supplier spread word that you would like to sell them. While you won’t get top dollar, something is better than nothing. In closing, material handling carts and racks are an excellent way to protect products “in process” or those being shipped to the end user. Always rely on your packaging producer for guidance and direction to assure they meet your needs and produce the results you expected. This entry was posted in Carts, Stack Racks on November 24, 2011 by madden_david. Plastic Gaylord Containers are plastic bulk containers that can hold loose product, in a manner similar to cardboard gaylord boxes. In fact, plastic gaylords are more often called pallet containers, but many people in the industry see the similarity between pallet containers and gaylord boxes, so it is only natural to call them plastic gaylords. Some plastic bulk containers are very similar to gaylord boxes. Well, if you are looking to puchase plastic gaylords, specifically used plastic gaylords, then Container Exchanger can help you. We buy and sell used plastic gaylord shipping containers. See below for a couple of sample container pictures. Plastic gaylords are usually collapsible. Used collapsible plastic gaylords are made from a rigid structural foam material that is extremely strong and durable. These collapsible gaylords are suitable for many manufacturing applications, such as part storage or part transport. The weight capacity on collapsible plastic gaylord boxes varies, but generally, the capacity ranges from 1,500 lbs to 2,500 lbs. The other primary options with plastic gaylord bins is the color and the number of drop doors, or access panels. The access panels provide a way to access product that may be in the bottom of the bin without an operator leaning over the sidewall of the container. Some boxes are more common than other boxes. Follow this link to see a nice representation of our plastic gaylords. From a compatibility standpoint, many of these containers from different manufacturers are actually stack compatible with each other. That is, Ropak, Xytec, and Buckhorns usually stack together, assuming that they are of the same footprint size. This entry was posted in Bulk Containers, Pallet Containers on November 24, 2011 by madden_david. 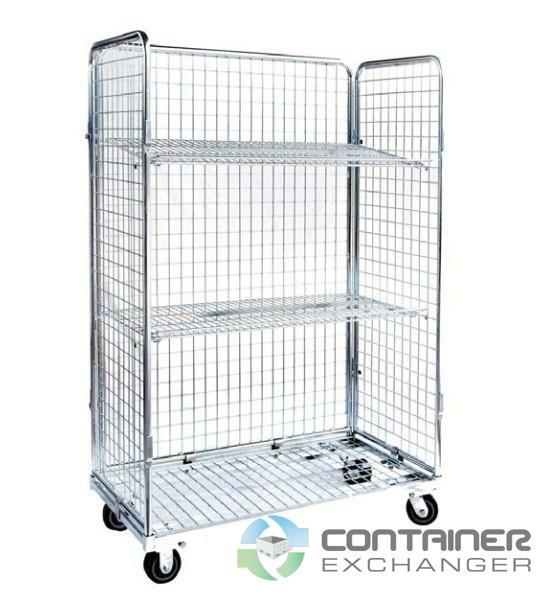 Container Exchanger specializes in used metal wire mesh collapsible baskets. We sell collapsible wire baskets for industrial use. Many of our wire baskets are made of steel, but some can be galvanized collapsible baskets as well. Our industrial quality wire mesh containers are available at points throughout the nation, especially in the Detroit, Michigan area. We offer collapsible wire baskets and rigid wire baskets to large and small companies throughout North America. In addition to our large selection of used wire containers, we offer collapsible pallet containers, plastic totes, plastic pallets, wood crates, and cardboard gaylord boxes. 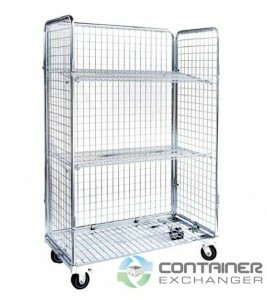 The wire mesh version of the bulk container can be collapsible, but quite often, they are rigid. 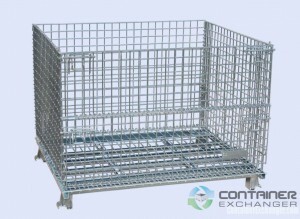 These wire mesh baskets are used extensively in industrial applications and they can stand up to quite a bit of abuse. You will find the rigid wire baskets are more durable than collapsible wire mesh baskets. Due to the tubular steel construction for the corner posts, they can handle more weight and they are generally easier to stack. By comparison, the collapsible wire baskets can be quite strong, but they are slightly easier to damage, and they are not quite as sturdy when stacked. Wire mesh baskets are a nice and heavy duty way to handle parts within a manufacturing environment. We have a very nice inventory of the metal wire baskets throughout the nation, but most of the containers tend to be located in Ohio, Indiana, Michigan, Pennsylvania, Missouri, and Ontario. 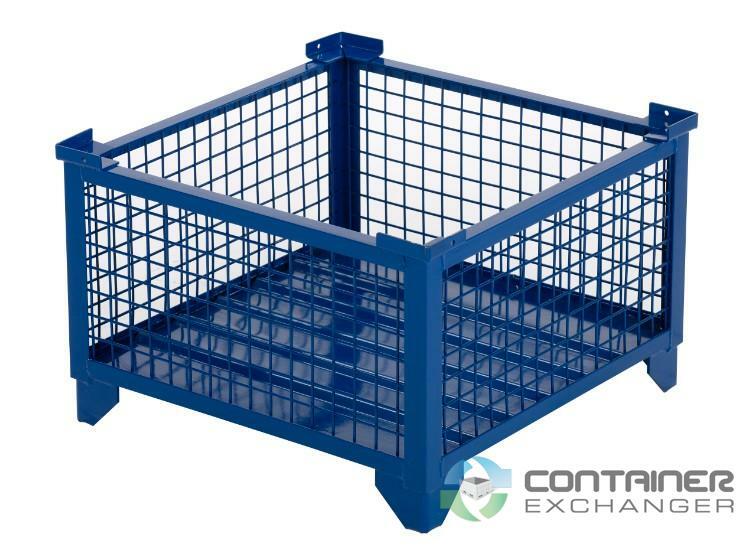 Collapsible wire baskets tend to be lighter duty than the rigid wire baskets. Collapsible bins tend to be weight rated between 1,500 and 4,000 lbs. The collapsible metal bins are a nice option for a small metal shipping bin. They work well in this situation, because the sides of the container can be collapsed, thereby reducing the size of an empty container. The collapsed storage bin can be stacked in a corner of the warehouse, or they can load onto a trailer for return shipment to your plant. This entry was posted in Bulk Containers, Metal Bins, Wire Baskets on November 24, 2011 by madden_david. Container Exchanger specializes in used plastic export pallets . We are experienced in selling and distributing plastic pallets throughout the nation. We are a supplier selling these plastic pallets to large and small companies throughout North America. Our used pallets can take many different forms. We generally handle several common pallet sizes and styles. Each pallet may be made from different materials and have different structural properties. Some Pallets are specifically made for the export market. However, we have found that we can sell used plastic pallets for export purposes and save our customers money. These pallets are made from plastic, and therefore, they meet international shipping guidelines (while wood pallets must be heat treated before they are shipped internationally). Plastic pallets are often more durable than wood pallets, because they are generally all molded in one piece, while wood pallets require nails to hold all the pieces together. Size requirements – While size requirements don’t really exist for product export, you may find that certain sizes do work well in intermodal (sea) containers. The most common size for export pallets measures 43″ x 43″ or 1100 mm x 1100 mm. This size of pallet can fit easily side-by-side on a sea container and they are large enough to put plenty of product on them. Stacking pallets are any pallet with runners. The runners (the strip of material that goes along the bottom of the pallet) go all the way across the bottom of the pallet. These runners serve a couple of purposes. The first purpose is for safety reasons. With the runners in place, a loaded forklift can go over rough terrain and not lose the load due to vibration because the runners prevent the plastic pallet from bouncing off the fork tines. The send reason is for stacking purposes. The runners provide a long strip of plastic material, and when the pallet is loaded, the weight from the load can be distributed over the length of the runner. When you place this pallet on top of another loaded skid, the presence of the runner distributes weight to decrease chances of damage to the lower pallet. An added bonus of stacking pallets is that when the pallets are empty and stacked, the forklift holes are readily accessible, which makes them easy to access by your forklift. Nesting pallets do not have runners. Instead, these used plastic pallets rest on pedestal feet. These plastic pallets are often made from thermoformed plastic, and as such, have slightly lower carrying capacity. The deep tray of a nesting pallet combined with it’s lightweight properties make this pallet a good choice for light weight applications. Many nesting pallets are also used with plastic top-caps for the same skid of product. The topcap prevents any material damage and when another pallet is stacked on top, and it help secure the load when the pedestal feet cross-link together. These plastic pallets are used more frequently in circular supply operations between manufacturing plants. How to buy Used Plastic Pallets? You can buy used plastic pallets through Container Exchanger. Navigate your website browser to our page of Plastic Pallets for sale, locate the ones you wish to purchase, and fill out the form on that page. Container Exchanger will then contact you to answer any questions, provide shipping quotes, and complete the sale. This entry was posted in Pallets, Plastic Pallets on November 24, 2011 by madden_david. Container Exchanger specializes in used metal and plastic bulk containers. We sell and distribute bulk bins throughout the nation. We supply collapsible bulk containers and rigid bulk containers to large and small companies throughout North America. Our bulk containers can take many different forms. We generally handle three types of bulk storage bins. Each type is made of a different material. We have inventories on Plastic bulk containers, Metal bulk containers, and Cardboard bulk containers. The plastic version of bulk containers are usually collapsible. Here at Container Exchanger, we call them “Pallet Containers”. You can browse through our selection of used plastic bulk containers in our Pallet Containers section. They are made from a rigid structural foam material that is extremely strong and durable. This style of bulk container is well suited for many manufacturing applications, such as part storage or part transport. The weight capacity on bulk plastic containers varies, but generally, the capacity ranges from 1,500 lbs to 2,500 lbs. The other primary options with plastic bulk storage bins is the color and the number of drop doors, or access panels. Drop doors provide a way to access product that may be in the bottom of the bin without an operator leaning over the sidewall of the container. This ergonomic feature is present on virtually all containers. The only time you don’t want drop doors is if you are storing loose, bulk materials in the bins and the product is creating excessive sidewall pressure. Some containers are more common than other containers. Follow this link to see a full list of our used bulk containers. We may have different or more containers available, so don’t hesitate to contact us with specific requests! From a compatibility standpoint, many of these containers from different manufacturers are actually stack compatible with each other. That is, Ropak, Xytec, and Buckhorns usually stack together, assuming that they are of the same footprint size. The metal version of the bulk container can be collapsible, but most often, they are rigid. We have a very nice inventory of metal bulk containers throughout the nation, but most of the containers tend to be located in Ohio, Indiana, Michigan, Pennsylvania, Missouri, and Ontario. Metal bins are a nice and heavy duty way to handle parts within a manufacturing environment. Metal bulk containers that are collapsible tend to be lighter duty than the rigid metal storage bins. bulk bins tend to be weight rated between 1,500 and 4,000 lbs. The bulk metal bins are a nice option for a small metal shipping bin. They work well in this situation, because the sides of the container can be collapsed, thereby reducing the size of an empty container. The collapsed storage bin can be stacked in a corner of the warehouse, or they can loaded onto a trailer for return shipment to your plant. Wire bulk containers are another version of the metal bulk container. These bins are made from wire mesh, as opposed to steel tubing and steel sheeting, as is often found.in the solid metal containers. Wire bulk containers often have less carrying capacity, as they are a lighter-duty and made from light-duty materials, such as 1/4″ or 3/8″ wire mesh. These bins do, however almost always lighter in weight and they are collapsible, which makes them much more economical from a shipping standpoint. We can find just about any bin. Follow this link to see a nice representation of our used metal bulk bins or our used wire baskets. This list is not always complete, please contact us with any specific request that you may have! Cardboard bulk containers are generally referred to as Gaylord Boxes. Most bulk cardboard boxes come from plastic injection molders, where the boxes once held raw plastic resins. Other boxes can come from storing food products, such as watermelons or lettuce. Clearly, due to the different uses for large cardboard boxes, there are many different styles, thicknesses, and weight capacities. No matter what your requirements are, purchasing used gaylord boxes can be challenging. There is often more demand than supply, and significant quantities are going to be the minimum purchase amounts. These bulk containers are not necessarily bulk in a traditional sense, especially when they are compared to the metal and plastic bulks. However, they could be considered bulk in that they are folded down flat for transport. Some businesses use these boxes over and over again, but the useful life of a cardboard bulk container is probably about 5 uses. Follow this link to see a representation of our used gaylords. This entry was posted in Bulk Containers, Gaylord Boxes, Insulated Containers, Metal Bins, Pallet Containers, Wire Baskets on November 24, 2011 by madden_david. As industrial automation continues down its lean manufacturing journey, the area of packaging waste has taken center stage. The way to reduce this packaging waste is returnable packaging. The EarthWorks Group estimates that 30% of landfill waste is created by plastic and paper packaging. The use of cardboard products and other one-time-use packaging products contribute significantly to this waste. Folding bulk containers, industrial totes, and metal storage bins are used over and over again within a facility or between a supplier and a customer. They can be used literally thousands of times. These bulk boxes are much cheaper in the long term when compared to buying cardboard boxes and wood crates every time that product is shipped. Savings can be observed in the per piece packaging cost. While the upfront investment in returnable packaging may cost more, savings can be realized quickly through repeated use (the same bulk containers, metal bins, and totes are used over and over), labor (no more box assembly), material handling (fewer moves from stackable containers), quality (fewer rejects due to damaged packaging), and floor space (plastic and metal containers can stack very high). The per piece packaging costs for used bulk containers and totes can be as low as 5% of the costs for a comparable expendable solution, depending on shipping volumes. Plastic pallets come in a couple of varieties. For the most part, they are made from structural foam, but there are also thermoform pallets available. The structural foam pallets are more rigid and durable than the thermoform version. Usually, the more rigid plastic pallets are paired with an HDPE (high-density polyethylene) plastic returnable tote in order to create a plastic container pallet . This pairing works well, because structural foam plastic pallets typically have a shorter lip around the edge of the pallet, and the totes fit perfectly within the lip. To finish off the combination, a pallet cover is used to make the plastic container pallets stackable on each other. By comparison, when using plastic corrugated (typically a custom made tote), the thermoform pallet is a better choice, because it uses a much higher lip height. The higher lip height on the thermoform pallet catches tote edges easily. Plastic pallets can also be used as export pallets . Due to export pallet requirements, any wood pallets must be heat treated; alternatively plastic pallets circumvent these requirements. Used plastic pallets for export purposes make a lot of sense from a cost perspective, given that export pallets will rarely be returned to the company. Fortune 500 businesses, particularly automotive Tier 1 manufacturing suppliers, consumer product manufacturers, scrap steel businesses, and distribution and freight companies, are utilizing returnable packaging services as the next phase in a lean manufacturing initiative. Having maximized many of the plant floor operations, it is precisely this type of creative packaging purchase that empowers independent used equipment dealers, used equipment liquidators, and industrial end-users to eliminate another significant element of waste in their business model. Increasingly companies will convert entire operations to returnable containers as part of a company’s lean manufacturing methods. Improving packaging, transportation, and line-side presentation of containers are becoming the specific goals of the returnable packaging methodology. “Such a program will axiomatically benefit the environment by virtually eliminating waste from expendable packaging, while improving the bottom-line. When you’re ready to move on to the next phase of lean manufacturing, get in touch with Container Exchanger to find out how the right packaging choice can be used to optimize lean on your production floor. This entry was posted in Bulk Containers, Gaylord Boxes, Metal Bins, Pallet Containers, Pallets, Plastic Pallets on November 24, 2011 by madden_david. Thirty percent of landfill waste is created by plastic and paper packaging estimates The EarthWorks Group. The use of cardboard products and other one-time-use packaging products contribute significantly to this waste. David Madden, President of ContainerExchanger.com noted, “The initial investment in returnable packaging may cost more that one-time use packaging. However, savings are often quickly realized with returnable packaging because bulk containers, metal bins, and totes are used repeatedly.” Madden also pointed out that reduced labor costs are achieved with reduced or eliminated box assembly as well as reduced material handling achieved with fewer moves from stackable containers. Ironically there is an enhanced quality impact since there are fewer rejects due to damaged packaging as well as increased efficiency in floor space usage since plastic and metal containers can stack very high. Used Plastic Reusable containers provide the most cost-efficient shipping approach possible; corrugated one-way packaging is the least effective and most costly. “When a company is finished using a returnable packaging fleet, we represent the seller and find a buyer for the used bulk packaging. Sellers enjoy a high sales price for a better return on investment. Buyers save significantly in comparison to new packaging prices,” added Madden. The average price per trip for a corrugated one-way package is 54 cents versus a used plastic reusable container at just 2 cents. Buckhorn, Inc., located in Milford , Ohio provided some of these data in “How to Select Shipping Containers” Container Exchanger provided the Used Plastic Reusable Container data. The per piece packaging costs for used bulk containers and totes can be as low as 5% of the costs for a comparable expendable solution, depending on shipping volumes. Returnable containers provide a way to reduce costs and increase productivity in food handling and distribution because the food containers can go from processors to distributors to retailers efficiently. They offer flexibility to meet the requirements of users throughout the food supply chain. Depending on the specifications required, some containers are molded from FDA/USDA-approved materials and some also resist impact, moisture and temperature extremes of -20 degrees to +120 degrees Fahrenheit. While size requirements do not exist for product export, certain sizes do work well in intermodal (sea) containers. 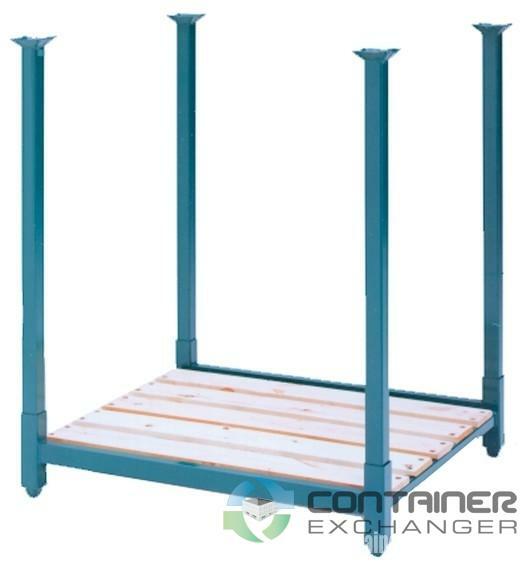 The most common size for export pallets measures 43″ x 43″ or 1100 mm x 1100 mm. This size of pallet can fit easily side-by-side on a sea container and they are large enough for plenty of product. Stacking pallets are any pallet with runners. The runners (the strip of material that goes along the bottom of the pallet) go all the way across the bottom of the pallet. These runners serve a couple of purposes. The first purpose is for safety reasons. With the runners in place, a loaded forklift can go over rough terrain and not lose the load due to vibration because the runners prevent the plastic pallet from bouncing off the fork tines. The send reason is for stacking purposes. The runners provide a long strip of plastic material, and when the pallet is loaded, the weight from the load can be distributed over the length of the runner. When this pallet is placed on top of another loaded skid, the presence of the runner distributes weight to decrease chances of damage to the lower pallet. An added bonus of stacking pallets is that when the pallets are empty and stacked, the forklift holes are readily accessible, which makes them easy to access by forklift. Nesting pallets do not have runners. Instead, these used plastic pallets rest on pedestal feet. These plastic pallets are often made from thermoformed plastic, and as such, have slightly lower carrying capacity. The deep tray of a nesting pallet combined with its lightweight properties make this pallet a good choice for light weight applications. Many nesting pallets are also used with plastic top-caps for the same skid of product. The topcap prevents any material damage and when another pallet is stacked on top, and it help secure the load when the pedestal feet cross-link together. These plastic pallets are used more frequently in circular supply operations between manufacturing plants. The International Food Container Organization (IFCO US ) now has hundreds of growers/shippers in North America and it is predicted that as food processing plants will dramatically increase their use of returnable containers. Product handling is reduced with some of these returnable containers because produce is often packed directly into containers where it remains until purchased by the general public. Reduced handling eliminates product damage possibilities. Container Exchanger helps companies save money through their unique online marketplace for used and new packaging items. This entry was posted in Bulk Containers, IBC Totes, Metal Bins, Pallet Containers, Pallets, Plastic Pallets, Totes, Wire Baskets on November 24, 2011 by madden_david.